How often have we said to our littlies that when they go to school they will learn to read? We build it up as such an expectation that there are those who go home disappointed because they did not learn to read on the very first day! It is why that I made sure every kindergarten student came to the library on Day 1 and went home with a book they had chosen themselves tucked safely into a smart library bag that also had a lot of other goodies in it so that the idea of the library being a good place to be was set from the start. However, as well as building up their expectation that they will learn to read when they get to school, there is much we can do to start them on their way long before formal instruction begins and which will help them develop a positive attitude towards reading and be successful sooner. It may take a little more than a day but it will happen. Reading is a very complex process, a learned behaviour that is so much more than decoding a set of sounds. Reading involves trying to duplicate in your head exactly what the author had in theirs- something that is impossible because our interpretations are shaped by our individual experiences – but nevertheless, the most successful readers are those who can best reduce the uncertainty of the meaning of the squiggles on the page. Of course a picture would help enormously in giving some sort of lead but there are a number of other concepts, cues and clues that the experienced reader brings to the text to help them work out its message – concepts, cues and clues that we use unconsciously but which we expect our children to master by the time they are about 6; concepts cues and clues that we can help them start to develop and use as we read aloud to them each day from their earliest days as they curl up on our laps in anticipation. Apart from the benefits of reading with your child from birth – the most important of which is their understanding that reading is a valuable, valid and valued activity that is worthy of your time and effort – there are lots of other things that children can internalise that will give them a headstart on reading and writing, as well as supporting their oral language and listening because each mode of language enriches and enhances the others. Long before formal reading instruction starts in school, little ones are learning and absorbing information about reading, developing understandings and attitudes about it that will shape their mastery and success. If they are comfortable in a print environment they will not only anticipate that they succeed in reading, but they will expect to do so. Learning in context is critical – even as adults we bring to any new situation or circumstance a range of background knowledge, understandings, skills, attitudes and values built on previous experiences and we flounder if we are in plunged into something so totally foreign that it makes no sense to us. Stories open up a world for our children that they cannot yet experience for themselves so while they may never have seen a monkey, for example, pictures, discussions, actions and activities about them will help to build a minds-eye picture that they can draw on in the future. So building up an environment where print, in all its guises and formats, is presented in natural and meaningful situations helps the child feel comfortable and builds their expectation that they will soon be able to control it for themselves. Their motivation will come from within. Children choose stories because of the appeal of the front cover. It is the thing that says “Read me” to them more than the title, the author or even the topic. Colour catches their eye first and then the focus of the picture particularly if it is something they recognise like a dog or a truck or even a popular television character. Who do you think will be in this story? Where do you think the story will take place? How do you know? Remember when we went to the … and we saw… Do you think there might be some of those in the story? By getting them to make some simple predictions like this not only builds up the anticipation but also lets them begin to take risks within a very safe environment. You don’t have to teach children for very long to know how much they enjoy having their thoughts confirmed and “Told you so!” is spread around the group! Telling the child the title and the author is important as that helps their understanding of books in general, and if the author is one who is not only prolific but writes quality stories they are already familiar with, they will begin to add another selection strategy to their toolkit. As well as setting them up for what is to come, the cover also helps build the concept of directionality. Knowing which way up the cover should be and the direction in which it opens begins the process of knowing their way around a book as well as learning positional words like ‘start’, ‘beginning’, finish and ‘end’. It helps them learn which way to turn the pages – indeed, that a story continues over a few pages each one leading into the next until the tale is told. That, in itself, is another concept to understand as the child builds the idea that a book contains a complete story. Picture books are perfect for the very young because they usually deal with just one problem and its solution within its covers but as they mature, even quite young children can cope with longer books that have a complete story in one ‘chapter’ each featuring familiar characters from the previous episode. This enables them to carry their thinking over several stories and several days. Later they will be ready for novels and even series, but it all builds from that initial expectation. The Magic Faraway Tree series by Enid Blyton is a perfect example of a stepping stone between picture book and novel. Unlike talking and listening, interpreting written language is not an innate behaviour – it is learned and right at the beginning of that learning is the difference between print and pictures. While the best picture books are a seamless marriage of text and graphics, each has a separate role with the illustrations enriching and enhancing the words on the page. Like the cover, it is critical to start with the picture so the child’s mind can focus on what is likely to happen in that phase of the story – it is the very beginning of making meaning as they begin to make connections between what they are seeing and hearing. So talk about the pictures, have them tell you about what they think is happening, encourage them to look for familiar things and introduce new vocabulary for unfamiliar things, search for details and make predictions about emotions and actions. Then, when you read the text explicitly make the connection to the words so they know that they are carrying the author’s message. What sorts of things could be explored in this iconic image from Possum Magic by Mem Fox? Picture cues are even more important when children begin to read for themselves so the child who has learned to look at them in detail, recognise unfamiliar objects, interpret things like mood through the use of colour or movement through the use of lines is going to be at an advantage in predicting what the text will say. If the child really tunes into the pictures you may well find that they will return to the book again and again independently “reading” it because the pictures act as triggers for the plot of the story. 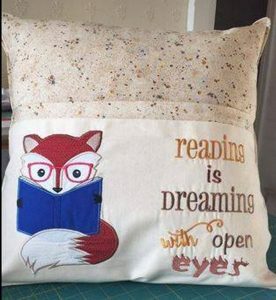 Even ifthey read it using different words each time, they are still laying solid foundations about the fun of reading and that it is something they will soon have control over. Assuming we are working with and reading to children in English, learning left-to-right directionality is critical. Knowing how we turn the pages and that the story starts or continues on the top left of the left-hand page and moves to the right and then back to the left again working down the page and then on to the top of the next page is a key concept that we often assume little ones know. Teachers using big books or books on screens that all children can see will often use a pointer to follow the words as they are read to emphasise the direction of the print, but parents can also do it as they read using their finger in a flowing movement. Asking the listener questions like “Can you show me with your finger where we start to read?’ and “Where do we go next?’ reinforces the concept while actively engaging them in the reading with movement and confirming their understanding. Even when different fonts or shapes are used to emphasise different words, the best books still use that left to right, top to bottom format so that it becomes a natural tracking pattern for the eyes. While much is being made (again) of the need to teach and test phonics (the correlation between letters and the sounds they make) as an indicator of reading ability, children need to understand the concept of a word. When we speak or read aloud we don’t put spaces between the words – everything just runs together in a blend of sounds that make sense to the ear if the brain has something to connect them to. It’s why early writers will often write “priminister” because they have not distinguished the two separate words of “prime minister”. Without getting into a debate about phonics versus whole word learning, it is worth knowing that English is a confusing language to learn phonetically not only because of its diverse roots from so many other languages but also because we have just 26 units to represent about 44 sounds (depending on dialects). Our literature is littered with rhymes that highlight the difficulties that relying on letter-sound relationships can cause so helping young learners understand what a word is – defined by the Oxford English Dictionary as “A single distinct meaningful element of speech or writing, used with others (or sometimes alone) to form a sentence and typically shown with a space on either side when written or printed – seems to make sense. Perhaps the first and easiest word a child will recognise is their own name and then this is followed by the names of familiar things, particularly those for which there is a concrete connection and which have meaning for them. The trickiest words are those that connect the nouns and verbs such as “my, to, is, said, here, the” and early childhood teachers have a variety of strategies that help make these sight words automatically recognised. Back in the 70s Glenn Doman was promoting the concept of teaching toddlers to read by placing cards with the names of things like ‘television’ and ‘refrigerator’ on the actual objects so that the child would see them, make the connection between word and object and later recognise them out of context. Making explicit connections like this by writing the child’s name on clothing or books, or labelling their drawings or pointing out the word “monkey” underneath the picture of a monkey in a book certainly helps them develop the concept of what a word is so that when their formal reading instruction begins it is a concept that is mastered and they can match their finger to specific words. Nevertheless, knowing the individual letters of the alphabet and the sound they make is a critical skill for reading as well as writing. Early skill in letter knowledge [is] a good predictor of early progress in reading during the first year of instruction. Knowledge of letter names and sounds does not assure success in acquiring a sight vocabulary but lack of knowledge produces failure. and some letters such as ‘m’ and ‘s’ will be recognised before others. Best practice to help them is to write like a book – beginning sentences and names with capital letters and then using lower case – so you are modelling not only what they see but also what they will be expected to do. 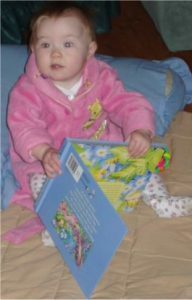 Children will mimic what they see the significant adults in their world doing and so role-play reading is an important step in the continuum of becoming a reader. Thus the model we offer and the encouragement we give are critical. Because it is the foundation for developing attitudes and expectations about reading, this is the most fundamental and important phase of the reading journey and something that every parent and grandparent can help develop while having the best fun together. PS. That bunch of squiggles in the picture – the only clue is that it’s title is Jack and the Beanstalk. Now put yourself in the shoes of a beginning reader to work it out and take note of the strategies you use automatically, including what you already know of the story and how that helps you and those you need to really concentrate on to make it make sense. It’s worth doing just so we can go back to being a five-year-old again!